The heartwarming picture of an elderly man feeding his wife ice cream in a parking lot in sweltering 98f summer heat has gone viral. Pastor Brent Kelley, 34, from Nashville, Tennessee, had taken his children to get ice cream at a Sonic on Monday. The family had just come from the pool on the hot afternoon when Kelley saw an older man sitting just inside his open car door. Kelley quickly realized the man was feeding his wife ice cream. The pastor at Ignite Ministries in Nashville took a photograph of the adorable couple and put it on Facebook that evening. He wrote a post to go along with the poignant photo. 'So today, I took the kids to the pool and we stopped for ice cream on the way home,' Kelley wrote. 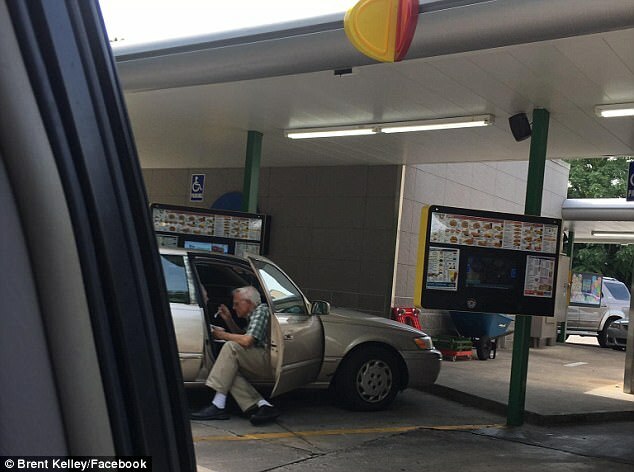 'When I got my ice cream and pulled out, I realized that this elderly man beside me was sitting out side his car door, spoon feeding his wife ice cream who also looked in her late eighties.